THE NEW ATHENIAN: Greek reform: The Force Awakens? Greek reform: The Force Awakens? Until last week, the left appeared unchallenged at Greece’s helm. Conservative New Democracy had been at sea since its election loss to Syriza a year ago and again last September. It bungled a nationwide election for its own party leadership in November, when software failed to perform. In the defeatist atmosphere, a grand coalition with Syriza to push through painful austerity measures seemed likely. But on Sunday, the party base elected 48 year-old reformist Kyriakos Mitsotakis to lead the party, and that has set the stage for a confrontation with the ruling leftists, and another turbulent political year in Greece. “We have but one purpose: For New Democracy to express all those forces that are opposed to the populism of an incompetent government,” Mitsotakis said on Sunday night. The mayhem of media and supporters in his office exuded the energy of a general election victory. Mitsotakis’ election has caught Syriza at an especially vulnerable moment. More than 70 percent of Greeks believe that the country deteriorated last year under Syriza, according to a recent survey for a major Sunday newspaper. More than half believe this year will be worse. The government stands on a majority of just three MPs in parliament. Since capitulating to austerity in July, it has been forced into the same straitjacket of unpopular measures as its socialist and conservative predecessors; but public anger at a mandatory pension reform that would result in a 15 percent cut has presented it with greatest challenge to date, because Syriza had vowed never to touch pensions. “New Democracy won’t become Tsirpas’ accessory,” he said, referring to the leftist prime minister. As minister of public administration reform, Mitsotakis presided over some 5,000 dismissals from the 620,000-strong state payroll in 2014, and introduced worker evaluations. Syriza repealed the evaluation law and hired back everyone who wanted to return. None of New Democracy’s 75 Members of Parliament openly declared their support for Mitsotakis during his campaign. Like most Greeks, they expected the winner to be Mitsotakis’ opponent, interim party chief Evangelos Meimarakis, a sexagenarian former defence minister who hails from New Democracy’s dominant populists. Yet he appears determined to go on the offensive. “New Democracy needs a reboot,” he said on the campaign trail. Mitsotakis is often referred to as the outsider candidate, but he is hardly an outsider to politics. His father served as conservative prime minister. His sister served as mayor of Athens and foreign minister, and lost a bid for the party leadership in 2009. The reformist pedigree now seems to vindicate the family. When Kyriakos’ father, Konstantine, became premier in 1990, the state controlled some 70 percent of the economy. 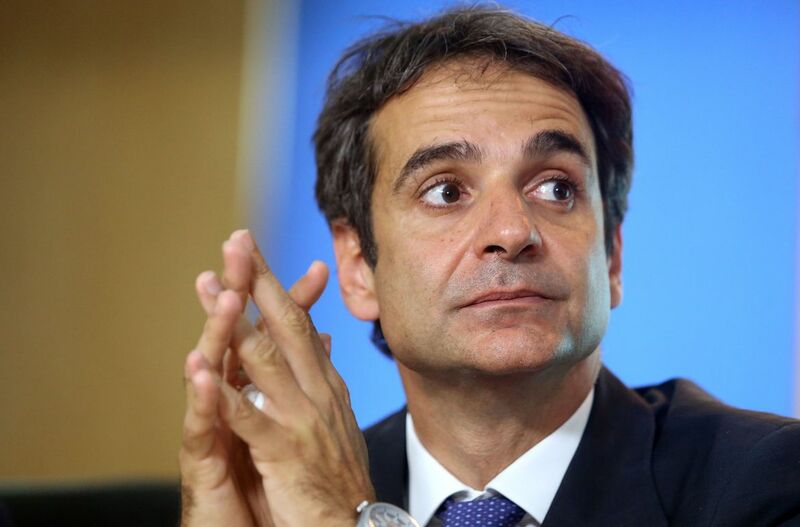 The elder Mitsotakis embarked on an ambitious privatisation programme. He liberalised banking, air transport and telecommunications. A series of public-private partnership deals created the new Athens airport, the Athens Metro, its ring road and Europe’s largest cable-stayed bridge over the Corinthian Gulf. The government fell before it could set into motion plans to sell public land and privatise refineries and new power plants. The younger Mitsotakis has demonstrated the same liberalising and reformist tendencies. But can he win over his party and the people? Not everyone agrees. “If one looks at the ND party, the large majority of its rank and file belongs to the populist and patron-client tradition. If [Mitsotakis] tries to purge all of them he would be risking a breakup of the party,” says George Pagoulatos, who teaches political economy at the Athens University of Economy and Business. History would seem to bear him out. Socialist party reformists alienated their populists, sending them into the arms of an obscure leftwing party. In 2009 that party took just 4.6 percent of the vote. Today it is in power. New Democracy is no stranger to fragmentation. Since the 1990s it has spawned no fewer than seven rivals, the most formidable being Golden Dawn. Much is at stake. Greece got where it is by failing to become a more transparent and meritocratic society. The resulting crisis broke the two-party system and brought more extreme parties into parliament. If mainstream politicians cannot persuade their own political machines to change, they stand little chance of convincing the nation.